Learners from Eastern Cape schools exposed to the science of road building as a career path. Makhosandile Nondinyana (left) a KSD TVET College civil engineering student who is doing his internship on SANRAL’s project in Cradock was explaining to learners how the periodic table help civil engineers use elements in material design. The South African National Roads Agency (SOC) Limited (SANRAL) exhibition at Scifest Africa 2018 proved to be a hit with school children in Grahamstown this month. Established by the Grahamstown Foundation in 1996, SciFest Africa is South Africa’s national science festival, promoting public awareness, understanding and appreciation of science, technology and innovation in South Africa. The festival celebrated its 22nd anniversary event from 7-13 March 2018 in Grahamstown. 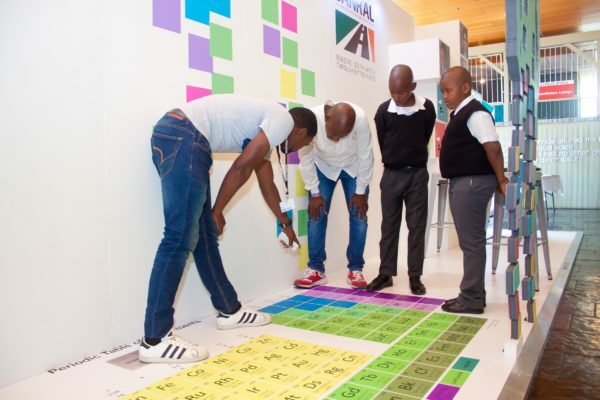 At this year’s SciFest about civil engineering, SANRAL’s exhibit explained the importance of building good roads, the different road signs and what line markings are. It also highlighted scholarship and bursary opportunities available to learners in primary and high schools. “Approximately 122 students at tertiary institutions are pursuing their academic goals with the support of SANRAL bursaries and about 196 high school learners have received scholarships,” Ah Shene concluded. Likhona Duba, an 11-year-old grade six learner at Sinako Lower High Primary School, had enjoyed the experiments and “really liked learning more about road signs and knowing the difference between permanent and temporary ones”. For Paul Papiso, a teacher at Sinako Lower High Primary School, the road signs part of the SANRAL exhibition was important as road signs form part of the natural science and technology syllabus.